International ACAC is affiliated with the US-based National Association for College Admission Counseling (NACAC). Membership is a privilege made available to eligible institutions, organizations, agencies and individuals as defined in the association’s Bylaws. International ACAC is a not-for-profit organization (taxpayer ID 141-82-7265). The organization is guided by Policies and Procedures. 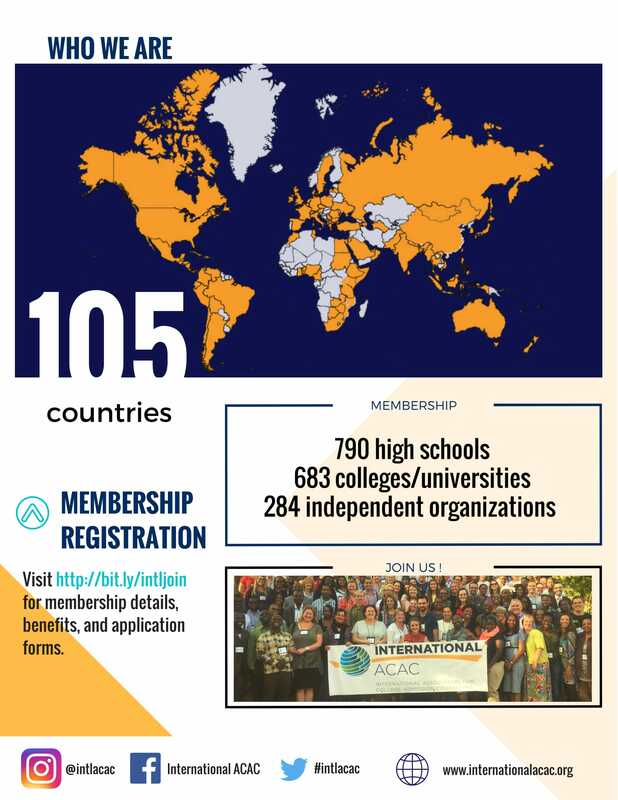 Our membership is made up of over 3,000 professionals from more than 90 countries worldwide dedicated to serving students as they make choices about pursuing post-secondary education. International ACAC is committed to maintaining high standards that foster ethical and social responsibility among those involved in the transition process, as outlined in the NACAC Statement of Principles of Good Practice. International ACAC effectively brings together primary and secondary school counselors, independent counselors, college admission and financial aid officers, enrollment managers, and organizations engaged in guiding students through the secondary to higher education transition process. International ACAC is THE organization to join if you are involved with assisting international students as they make their transition to higher education. Our summer conference provides a wealth of networking and learning opportunities but is only open to International ACAC members, so if you want to join us this summer you will need to become an International ACAC member. To join, go to "About Membership" or contact the Vice President for Membership.